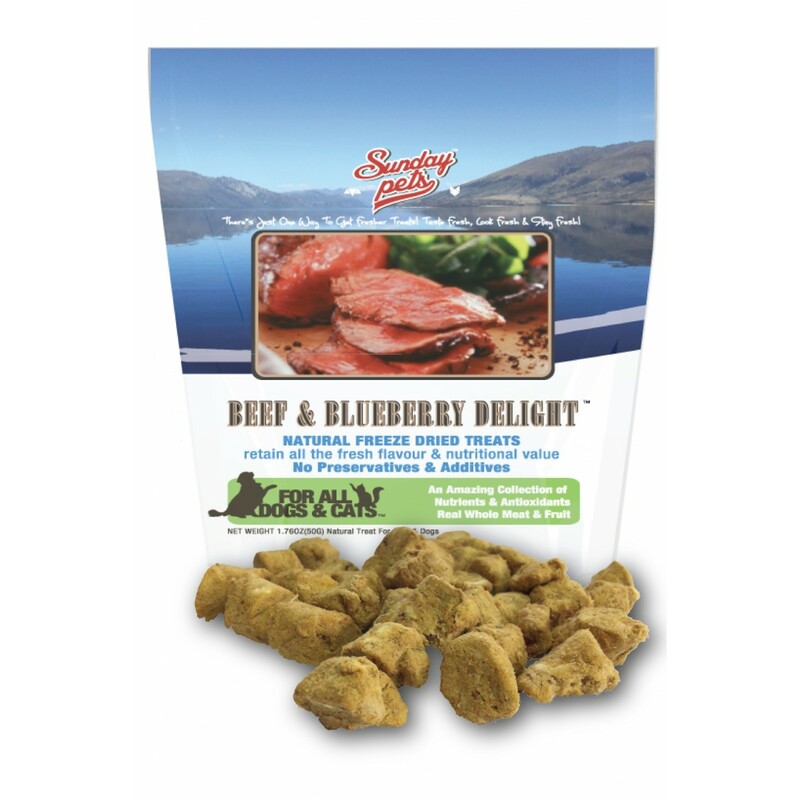 Sunday Pets NZ Beef & Blueberry Delight are delicious morsels of natural goodness designed to be a healthy, guilt free treat for your pet. 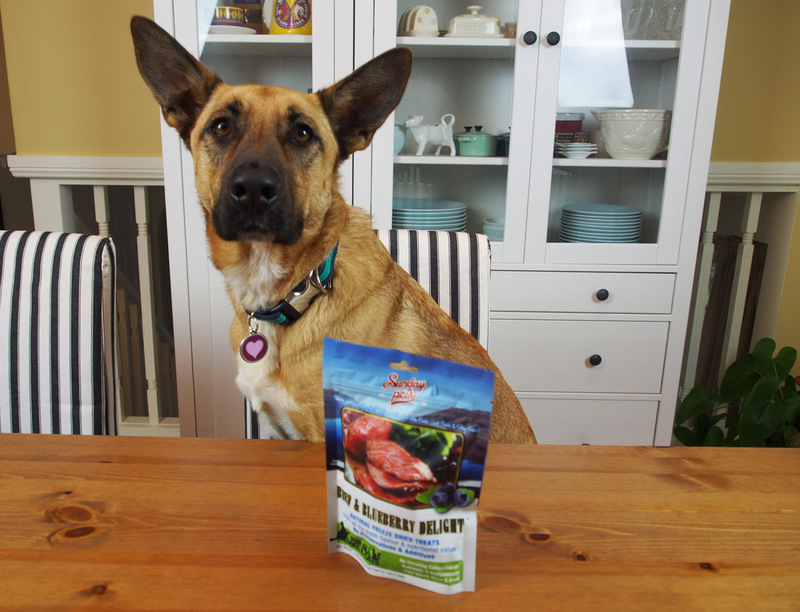 These freeze dried meaty treats are made from New Zealand free-range grass-fed beef combined with local blueberries, a natural source of antioxidants to support a healthy immune system. 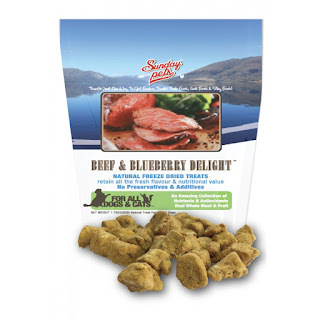 With no artificial preservatives, additives, grain, dairy or starch, Sunday Pets NZ Beef & Blueberry Delight treats are a delicious and healthy way to reward your pet and are suitable for both dogs and cats. 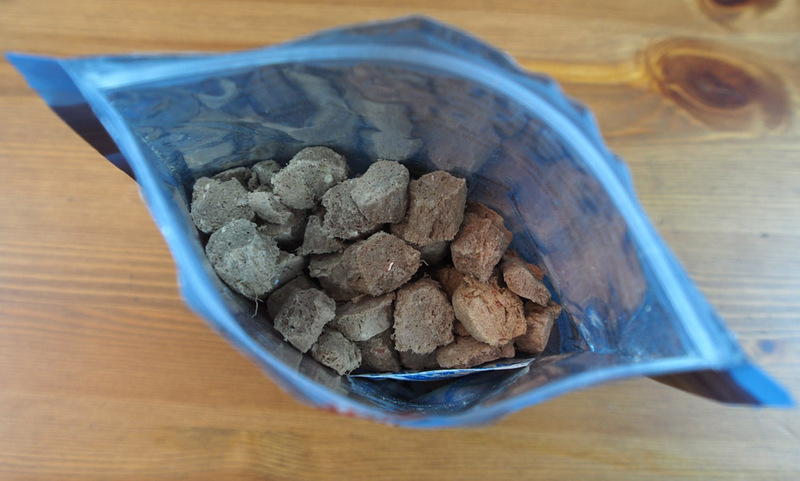 The unique freeze-drying process (24-hour at less than minus -50 ˚C ) creates a light, crisp texture that appeals to pets. It preserves the fresh flavour, aroma and nutritional value of fresh catch, while providing shelf-stable convenience. If you've never seen or touched freeze-dried treats, it takes a bit of getting used to as these are very light in weight (like cork) and don't smell at all, well to us anyway... Our tasting team however did not have such hang-ups and quickly understood this was food! If you are an advocate of a prey-like diet, there's a lot to like in these treats as their main ingredients are Beef Meat, Beef Heart & Beef Kidney which takes the Crude Protein contents to a minimum of 40% (unheard of any dog food we've come across so far) which is why they should be fed in moderation. Even though the pack is very small (50g) it could last you a couple weeks if you follow the manufacturer's advice of feeding 3-8 pieces maximum per day. With growing consumer demand for entirely natural treats, it's nice to see that some large companies have made the choice to provide high-quality shelf-stable treats containing no preservatives and additives. Not everyone has the time to bake doggie treats at home or pop down to the local market every week! Looking for a fish-based treat instead? The Sunday Pets treats range available in Australia also includes mouth-watering flavours such as NZ Green-Lipped Mussel, NZ White Fish and Lamb & Manuka Honey. RRP: $9.95 (50g) from pet stores and online. NB: As with all treats, these are designed for intermittent or supplementary feeding (max. 3-8 pieces per day) and do not constitute a complete and balanced diet.